The clocks change tomorrow and the nice weather could easily have you thinking summer is about here. As a result, I have spoken to a few people this week about their holidays goals and what they need to do to be in shape for them. In such conversations it is always important to stress the concept of time frames. The internet is awash with horrendous cheap body transformation products that for just a few dollars are happy to give you some impossible lies about potential results. They play to the last minute panicking person. Change In How Motivated You Feel – Minutes to days – You can change your motivation state in a matter of moments. I help people do this all the time, when you see what is possible, when you forgive yourself for what you haven’t done and tie it all to a sensible plan you can find motivation instantly. Change In How You Feel Physically – Three to Seven Days – Through changing your food and movement patterns a little you can transform how you feel in just a few days. Cut out the foods that commonly agitate the body, reduce food portions and start moving daily and most people will feel on top of the world by day seven. Sometimes you can feel a little worse for a couple of days before rebounding back nicely. Change in Fitness and Physicality – Three to six weeks – It doesn’t take too long to blow some cobwebs off and begin to feel better physically. With a few exercise sessions a week you can regain much of your previous fitness within three to six weeks. If new to exercise you can nicely form a nice exercise base in six weeks. Injuries can often be cleared up in similar time frames with the correct rehab programme. Change In Body Shape (Weight Loss) – Four to Twelve Weeks – Despite popular belief speed of body fat losses are in the stacked in your favour. You can be a dress size or two over your goals for ten years yet when you bring it all together can achieve this in three to four months. Fat loss is much quicker than people think yet at same time slower than they would like. When going at a nice rate you should see a subtle change every week though nothing overly spectacular, but if you run four weeks together then everyone is wondering what you are doing. Keep this going to make eight weeks and comments come from every direction. Continue for twelve great weeks and you have achieved something most will not believe. I have spoken before about how linear dieting, where you lose fat every week consecutively, is both very difficult the longer you go on and also has poor results maintenance long term. Therefore, I prefer alternated periods of fat loss and maintenance which though slower short term is much more powerful longer term. If you factor these in then maybe the time period is more six to sixteen weeks for great changes. In this scenario it is important to remember it will feel much easier to do than usual approaches of getting in shape. Changes In Body Shape (Muscle gain) – 6 Months plus – While I am very positive on the speed of results you will see with losing fat when it comes to gaining true muscle the results are much slower and more patience is needed. The average person is going to need at least six months to see significant changes in lean muscle gain. While it may seem a little demotivating I feel it is more important to accept reality and go from there. Most peoples confusion over speed of muscle gain comes from either, gaining fat while gaining muscle so you appear to grow very quickly or the other side to this coin, by losing fat it makes you appear more muscular yet the actual limbs are smaller in diameter. This is what most normal goals of toning are achieved, simply losing fat. What Does This Have To Do With Holiday Programmes? As you know it is April the first on Monday which means it is three months to July 1st or four months to August 1st. If you insert the above timescales into the equation most people need to start their plan of action about now. If you mobilise quickly you have more than enough time for the average goal to get there at a comfortable and steady pace. The above timescales of course assume you are already fairly well skilled in the needed behaviours to change your body. The vast majority of people are not so this element may take a few weeks or more before you are able to easily deliver in the above timescales. Most struggle with this element and thus most people never achieve their goals. I cover how to do this more my book Change Your thinking- Change Your Shape and currently working on my new book which I hope to release next year. which will supersede the last one. For now these methods are within my coaching services in-person and online. 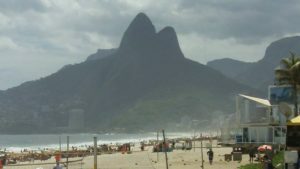 Photo – A cloudy day in Rio De Janeiro from back when I lived in Brazil.